These muffins met all of my lofty demands with vigor. They are tasty and moist, and can really handle any ‘berry’ you throw in them. Or, nuts, or fruit, or just about anything. 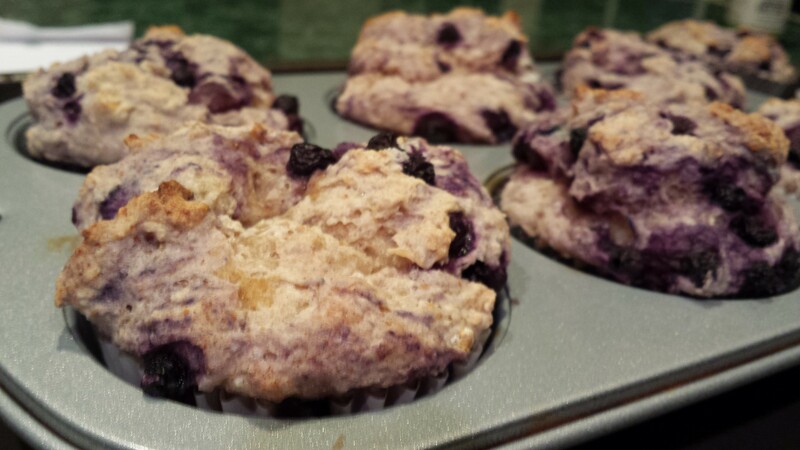 Blueberry is my favorite muffin – type. Which is odd, because it’s the only form of blueberry I really enjoy. So let’s make them. And then – keep this recipe in your back pocket – for all of your muffin-fixes. In a large bowl, mix together gluten free flour blend, salt, baking powder, cinnamon and nutmeg. Mix well. Add the rest of the wet ingredients (maple syrup, vanilla, apple sauce, water, apple cider vinegar) (but not the fruit) into the flax eggs, stir well. What are your favorite muffin-mixins? Yum! I wonder if Bob’s Red Mill AP GF Flour would work here. It has garbanzo bean flour in it which scares me when it comes to sweet items since GB flour is so, well, not sweet. Hmm. I’ve never tried that exact blend – but I have tried some of the other store bought blends in recipes like this and they do usually substitute well! As long as it has xantham gum, I usually don’t add anything additional to the mixes to substitute them (in an already GF recipe). I’d love to hear how it turns out! 🙂 And thanks for stopping by!